This is a photograph taken with my dear friend Rungnapa on my second trip to Thailand in 2006. We first met when my husband and I were teaching English for the summer in Bangkok. While he could not be here for this trip, I wanted to show him the amazing Thai food he was missing back in California. Purposely we had the photo taken after we had just finished an amazing meal at Mama’s, a place we had frequented back in 2004. It is hard to have a bad meal when traveling in Thailand with the different flavourable tastes and wide variety of vegetables and fruit from the region in south east Asia. To be quite honest the one meal that made me quite sick during that time was not even Thai food at all, but from a western style resturant in a shopping mall geared to tourists from abroad. However, I did end up getting sick and had to be checked into the hospital. It can be scary when you get sick and especially more so when you are traveling abroad. Making sure to read up on travel health tips during your planning stage should be priorty for all travelers. Tips like drinking only bottled water or eating yoghurt once you get in country are a couple of things I have adhered to in my traveling past. Luckily for us there are always new things coming out to aid us during travel so that we can focus on the experience abroad. Bimuno Travelaid. I was asked to try out and review a product made to help maintain travel health before and during your travels. Bimuno is a 100% natural travel health supplement designed to support the natural bacteria in your digestive system. This is to help avoid all sorts of travel issues with new cuisines, climate, and even stress. Being able to maintain the good type of bacteria in your system is the trick to having a happy stomach and a pleasant journey. How it works. They reccomend that you start taking Bimuno Travelaid seven days before your trip and continue daily while travelling. You take three of the chewable pastilles in the morning and then repeat each day. My Thoughts. I found it like having candy for breakfast as they taste like coconut flavoured gummies. It makes it easier to be proactive about acclimating your body’s digestive system. I no longer have to trek out and hope to find a store that would carry yoghurt. 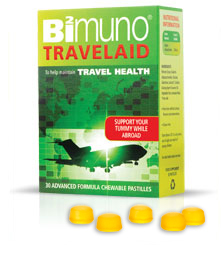 Bimuno Travelaid is a simple and practical solution that tastes great for maintaing your travel health while abroad. Bimuno has some great travel tips here that I wanted to share with you too. Giveaway | I am so excited to announce that Bimuno is giving a complimentary trial of Bimuno Travelaid to one of my lucky readers. To get your name into the drawing just sign up for the rafflecopter giveaway entry below! ——————- I wanted to give a shout out this week to Kelly from A Lovely Life Indeed for her travel post last week about coping strategies for the non-traveling traveler. She had five great tips fuled with some wonderful travel quotes I know you will all enjoy. With a passion for travel and a love for sharing her stories, you will find motivation to further fuel your wanderlust. Thank you Kelly! Now on to the link up! To link up with us, make sure to comment below and with my cohosts Melanie and Tina. Then hop around and share the love and experience more wanderlust from the other participants. The full details are below and as always, have fun! 1. SHARE a post about travel! From road trips to trips abroad and from past travels to dream vacations. You can write about travel tips and tricks, favorite places to stay, or anything in between! Just make it about traveling somewhere! 2. GRAB the lovely button above. If you run into trouble, just make sure to mention Bonnie, Melanie, and Tina in a link! 3. LINKUP goes live every Tuesday at 0800 GMT. Make sure to comment here, on the cohosts blogs, and visit around! 1. Please only one linked up post per blogger. Save other posts for future linkups! 2. The last Tuesday of every month will be a themed prompt if you want to join in! 3. 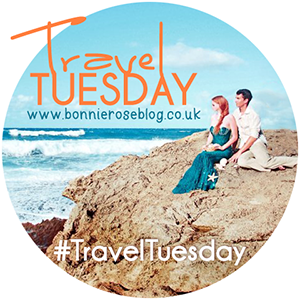 HOP around and meet new travel loving bloggers! Check back to visit some of the newer travel posts! ** This is not a paid ad and the opinions are my own. No worries, you do not have to post about food. 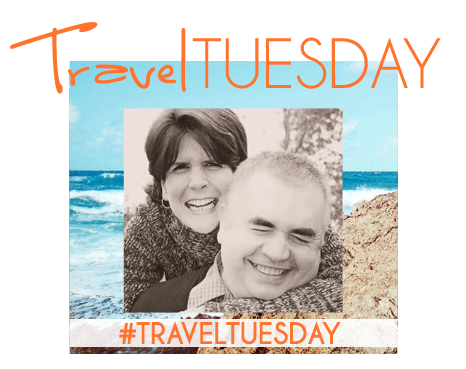 It is just a fun way to shake things up once a month for Travel Tuesday link up. Phew because I was a non-foodie too! Interesting, I am always looking for ways to stay healthy while traveling, I seem to be the one that always gets sick. Sounds like a good product to try. Sorry to hear you are the one that always gets sick. You should definitely enter to win this and see if it works for you. Did you get to travel after trying out this product? I wonder if it really works? Worth giving it a go for sure. Your travel health tips are very sound. It’s things like ice and salad that people forget easily I think. I just received the product a few days ago to share about it with everyone. I look forward to seeing how it works when I’m abroad as well. Avoid ice– the little piece of advice you ALWAYS forget until it’s too late and you just had to have that lime slushie. Interesting – I wonder what they have inside that helps with settling the stomach. Another thing people often forget to be careful of abroad are the fruits even if they have been washed. Usually they’ve been washed in water that may not agree with your stomach. Wow, what an interesting idea — and also, I knew about the bottled water but I never thought about salads or even ice!!! Good to keep in mind! I’ve also heard that eating local honey can also help with adjusting to a new environment, but something like this seems very convenient! The best tip I was ever given was in India by a local colleague, keep your mouth closed in the shower. It worked for me, but then I was mortified when I saw Charlotte in SATC2 get pilloried for the same procedure! Oh my goodness…I miss Mama’s. I crave it at the most random times. I had no idea you taught English in Thailand once! Have you written any blogposts on your time there? I’d love to hear more about it! Great advice! Being sick while traveling is the worst. I wish I had known about this before we took our major back packing trip through SE Asia. The last leg of our trip was along the Krabi coast in Thailand and after months and months of traveling that was the one place I got horrid food poisoning and couldn’t even leave our hotel room. I was so sad to miss the beautiful beach! Sounds like a good product although I think I would want to look at the research on Bimuno first before taking this, as it requires taking quite a bit of pills for quite a long time, especially during long-term travel. There appears to be at least one human study on traveler’s diarrhea and one on IBS showing symptom reduction so looks very promising. I normally just take a Pepto-Bismol tablet for the first couple days and then don’t normally have any problems. Yikes! I’ve heard of friends getting sick but luckily I never have. These are some great tips to consider. This looks perfect for me because I HATE yoghurt ! I am going to Mexico this summer so this would be nice to try to avoid getting ill! I hate getting sick when away, it has happened a few times before – the worst was in Guatemala when I was SO ill I kept nearly fainting. This looks like a great way to stay well!! Super tips and all very useful, and I think everyone needs a reminder about travel health. I followed these tips when I went to Egypt, and apart from one bout of tummy troubles, all was well! this is sounds like a great idea, as i suffer with crohns i really worry about catching travellers diarhea as im really susciptible to any bugs. ill checj these out for definite! THE GREAT DR GREAT WHO BROUGHT MY HUSBAND BACK TO ME IN JUST ONE DAY. My name is Nancy John from uk, I got married 1 year ago. My husband and I have been living a very happy and lovely life. So as time went on, I began to notice this strange attitude that he was possessing. He was now going out with other girls, to the extent that he was no longer picking up my calls, and he was not even sleeping in the house anymore. I became confused and didn’t know what to do anymore. So i became worried and stranded, that brought so many thoughts into my mind, because I have never experienced a thing like this in my life. So I decided to visit a spell caster, to see if he can help me out. So immediately I went to the internet, where I saw an amazing testimony of a spell caster who brought someone’s ex lover back, “DR iyare” so I contacted him immediately and I explained to him all my problems and he told me that it will be very easy for him to solve, compare to the ones that he has done before. And he also gave me some proof to be really sure of his work, and he assured me that my husband will come back to me as soon as he is through with the spell casting. And also he told me to put all my trust in him, and I really obeyed him. So it was 8:00 am on the next morning, when I was about going to work, when i received my husband call, and he told me that he was coming back home, and he was apologizing to me telling me that he is very sorry for the pain that he has cost me. And after some hours later, he really came back home, and that was how we continued our marriage with lot of love and happiness, and our love was now stronger than how it were before. DR iyare also told me that once my heart desire has been granted unto me that i should go and testify of his work right here on the internet. Right now I am the happiest woman on earth today as I am writing this testimony, and I want to really thank “DR great” for bringing back my husband, and for bringing joy and love to my family. So my greatest advice for you out there who your husband or your wife is acting strange, or you have any problem with your relationship or anything that has to do with spell casting,He is capable of solving any problems.All you need do is for you to contact this man anytime, and i assure you that he will be of help to you,I am 100% sure that he will solve it out.